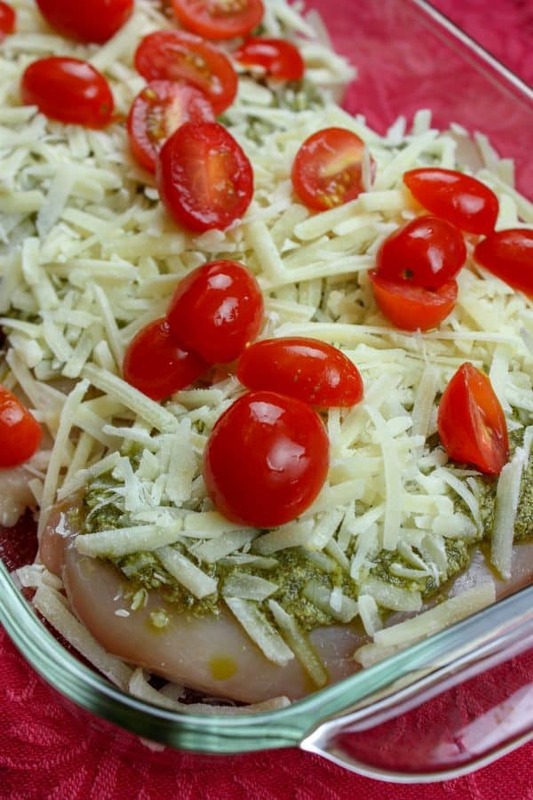 This Pesto Chicken Recipe is one of the easiest dishes to make. 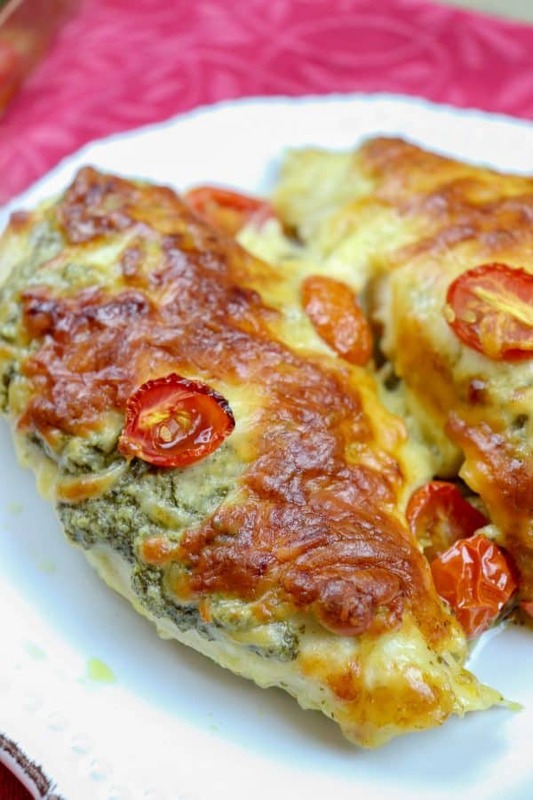 The pesto chicken bake is thrown together in five minutes and cooked in less than an hour. You can eat it with a side dish, cut it up in a salad, or as a chicken pesto sandwich. The rich and flavorful dish will certainly become a favorite. We stay busy around here throughout most of the week. I’m taking kids all over creation for music lessons, after-school functions, and then trying to help them get through homework each night. So, when I can fix an easy meal for supper, I am all over it. 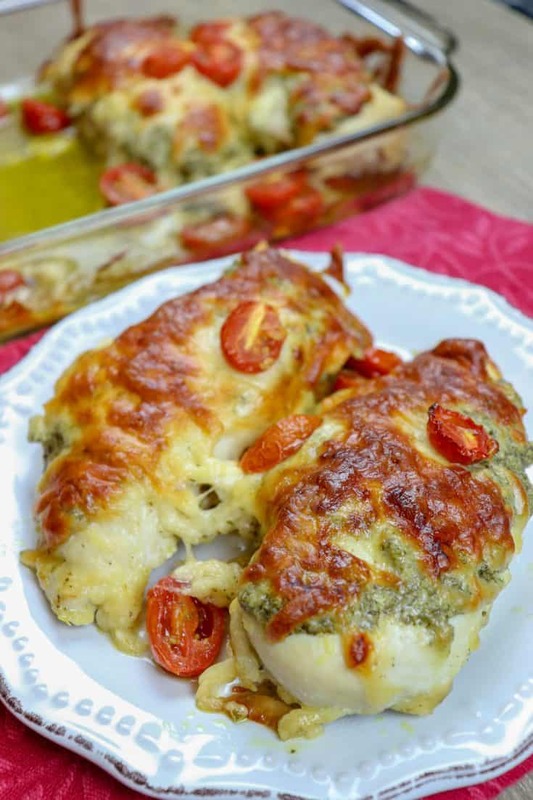 This chicken pesto bake has all the goods–pesto sauce, parmesan cheese, and cherry tomatoes–for a mouthwatering flavorful combination. And the best part? The chicken pesto bake takes all of five minutes to prepare. Yep, you read that right, five minutes. Bam. Done. My youngest will try anything, but I was curious if my oldest would like the pesto sauce. We don’t eat a lot of pesto around here and I’m not sure why because I love it. I even took a class way back in the day to learn how to make pesto. So, I was pleasantly surprised to find out that the oldest loved the pesto on the chicken. We ate the chicken with a side dish and it was filling. My husband is on a diet and took his piece of chicken, cut it up, and made a chicken pesto salad out of it. And, if you have leftovers, this also makes a great chicken pesto sandwich the next day. 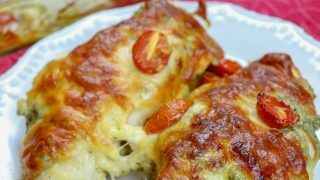 Lay your chicken breasts side-by-side in a casserole dish. You don’t need to spray the dish with non-stick spray since the chicken won’t stick in this recipe. I used four chicken breasts in this recipe because there are four of us here at home. You can use as little or as many as you’d like, and that’s another bonus of this recipe. 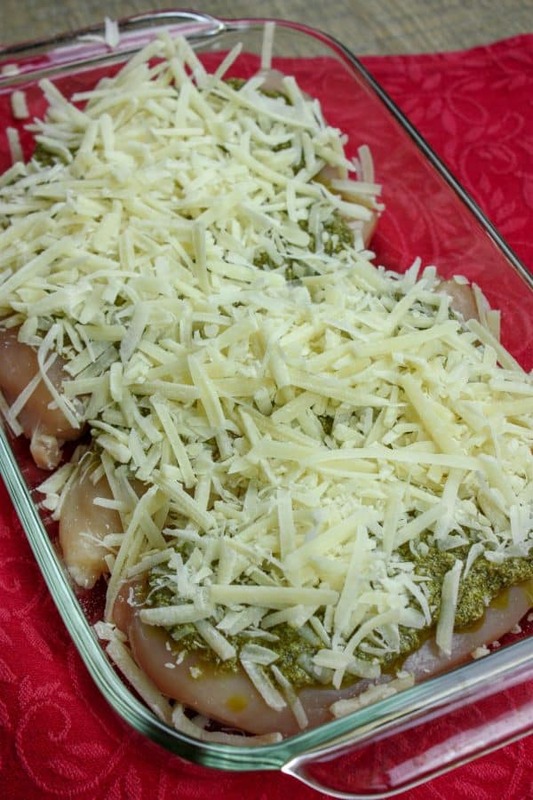 Spread the pesto sauce on top of the chicken. You can either make your own pesto sauce or buy it in a jar. 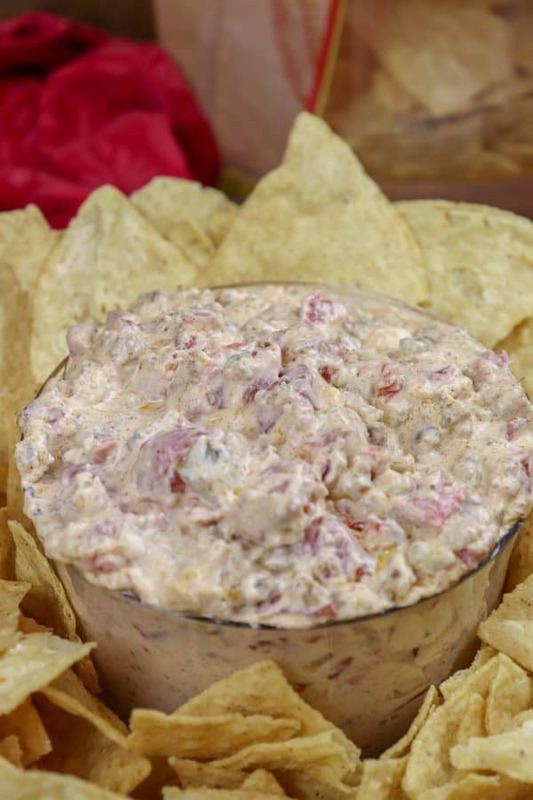 I used a jar for this recipe and it was very flavorful. If you buy the small 3.5 oz. jar of Alessi Pesto it will be the perfect size for the four chicken breasts. I used the entire jar, and you can see in the pic above that it was the right amount. It was affordable, too. Next, you’re going to sprinkle the parmesan cheese right on top of the pesto sauce. Easy peasy. Finally, cut the cherry tomatoes in half and throw them right on top of the pesto chicken. The tomatoes are going to add a little flavor and a pop of color, as well. They are so pretty! You can use just a few or a lot, whichever you decide to do. Chicken pesto with tomatoes sure adds a lot of flavor to an already great meal. 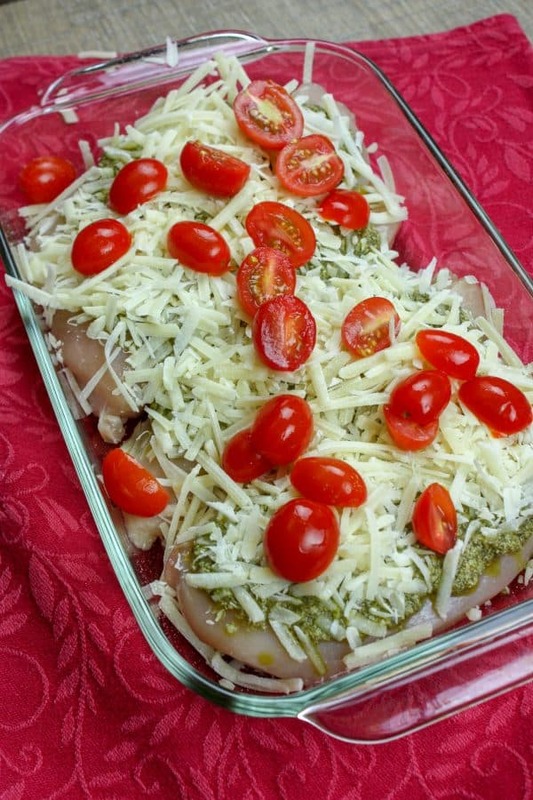 Once you get the cherry tomatoes on top of the pesto chicken recipe add it to the oven for 45-50 minutes, or until the chicken is no longer pink, on 350-degrees. If the cheese starts to get really brown, you can put some tin foil over the top for the last few minutes. Above all, this is one of the easiest meals to make for family. I just know y’all will love how it turns out. 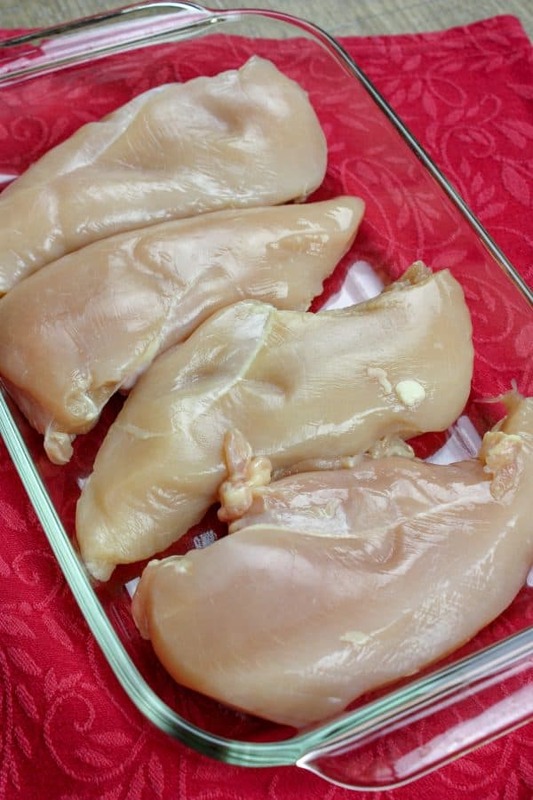 Add four chicken breasts to a casserole dish. 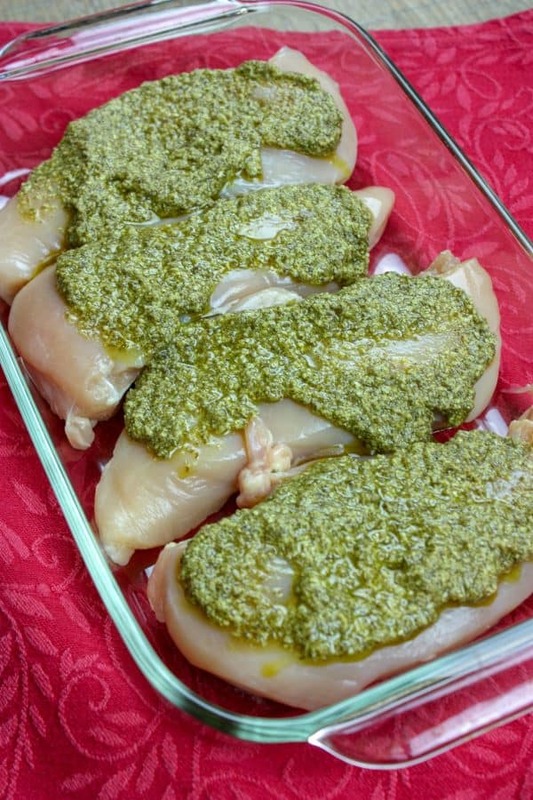 Spread the entire jar of pesto sauce over the chicken. Sprinkle the 8 oz. of shredded parmesan cheese over the pesto sauce. Slice the cherry tomatoes and sprinkle over the chicken. Bake for 45-50 minutes, or until chicken is no longer pink. If the cheese begins to brown, place tinfoil over the top for the remainder of the cooking time. 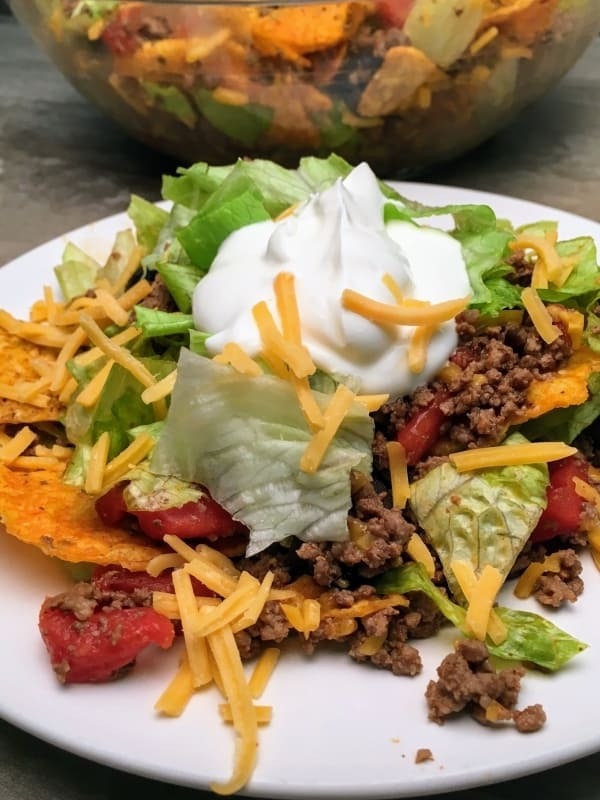 For more delicious recipes head on over to Southern Plate, The Country Cook, Julia’s Simply Southern, and Southern Home Express. I’m doing the Happy Pesto Chicken recipe dance. You’ll have to take my word for it cause you wouldn’t want to see my dancing but this recipe makes me happy! I LOVE pesto!! Hi Julia! Too funny! I love it. Pesto makes me happy, too! This chicken will have a fantastic flavor! Hope you are having a good week and staying warm. Thanks so much for sharing with us at Full Plate Thursday!